Thrifters Around The World is a new series where I interview passionate thrifters across the Globe. Today I'm interviewing Miss P from The United Kingdom. Tell us a little bit about yourself, Miss P.
I’m a 30 something (ahem!) mum of one (My Little Tornado!) and I live in a small town on the Essex coast, about 45 minutes from London with LT and my partner J. I attend college once a week to study garment construction and pattern drafting (another passion of mine) and spend a HUGE chunk of my time “thrifting” at local charity shops. I guess you could call it a mild obsession! I used to sell my vintage thrift finds on Ebay for a living and am in the process of re-launching this “career” (post baby) by opening my first ever shop on Etsy called LoveMissP. I began blogging as Miss P in October last year and am totally addicted. 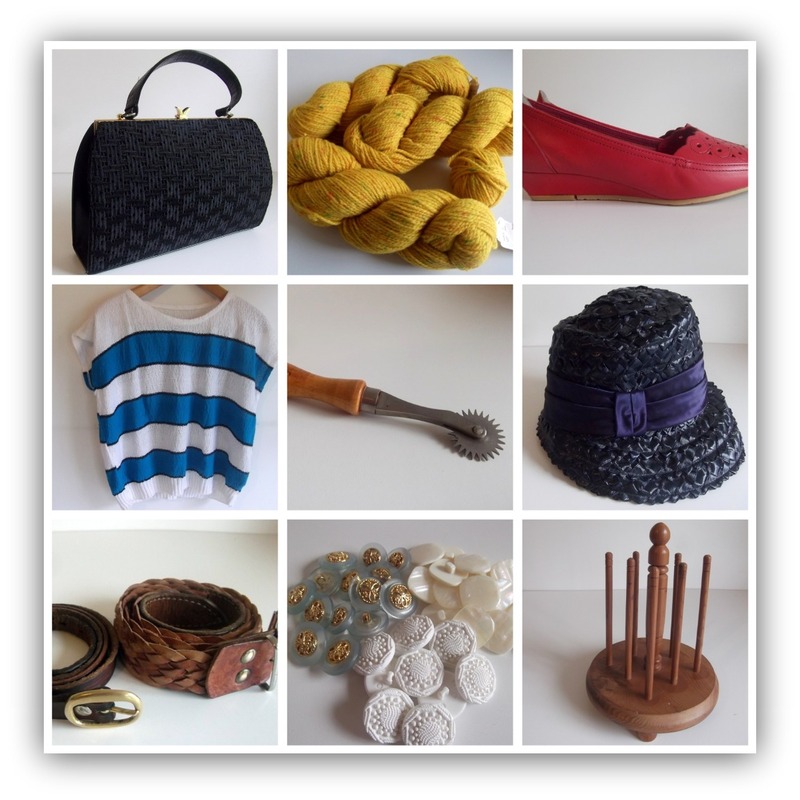 My blog is a mixture of thrifting, sewing and broader crafts. When I think about it I’ve been thrifting since forever! Some of my earliest memories are of the frantic hustle and bustle of local church jumble sales. I’ve loved it since I can remember. To me it was, and still is, like finding treasure. I never tire of it. What makes thrifting in the United Kingdom different than thrifting in the United States? I haven’t ever thrifted in the US so it’s tricky for me to answer this with any basis in actual experience. But as far as I can tell there are a couple of differences. Here in the UK individual charities will open and run their own fund raising shops whereas if I understand it correctly, “goodwill” is an umbrella network of stores in the US that benefit any number of different charities or causes. I don’t know if that results in some consistency in pricing in the US, but over here pricing strategies can vary wildly from shop to shop. At one end of the spectrum, some pitch themselves almost as mini boutiques promoting vintage and designer items. At the opposite end you have the “pile it high and sell it cheap” shop mentality (my personal favourite since I revel in rummaging!!) and then every conceivable level in between. We don’t have such things as Estate Sales, although these sound just like my cup of tea! Is there a large thrifting/junking/second-hand shopping culture where you live? I wouldn’t say large so much as growing rapidly. 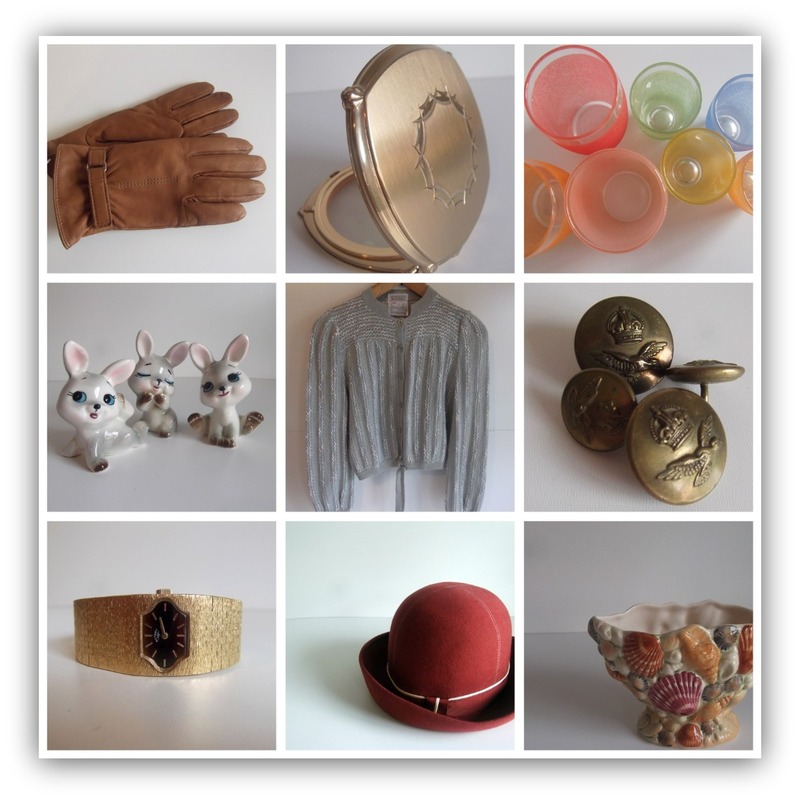 More and more people I speak to these days are open to a bit of second hand shopping or bargain hunting. Whereas a few years ago, most people couldn’t even fathom that you could get anything other than junk in charity shops. Is there a stigma against second-hand shopping in the UK? Is it seen as dirty or something that only "poor people" do? This definitely WAS the case a few years ago. 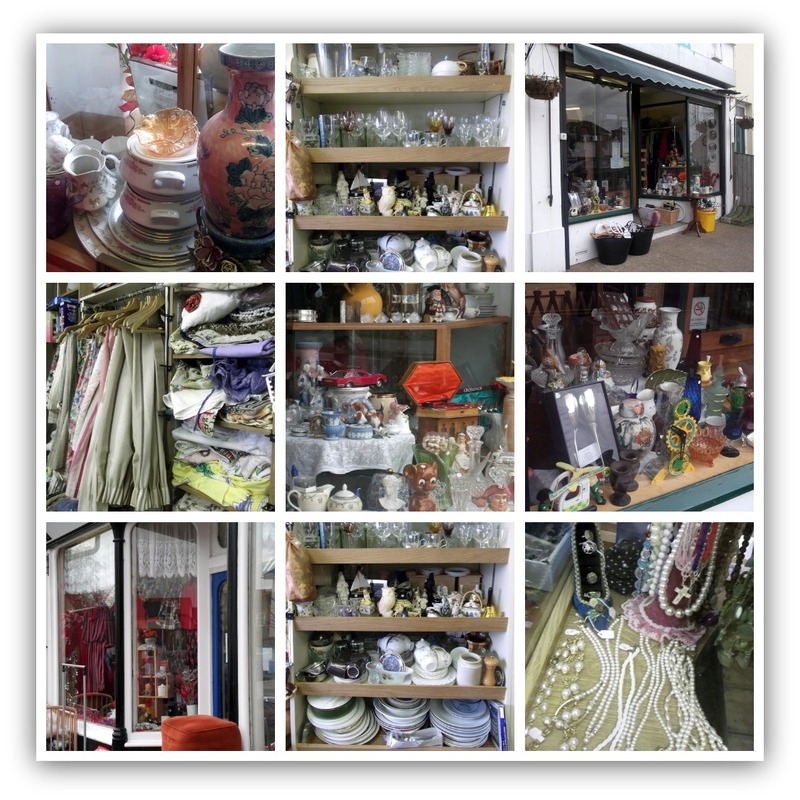 There was a perception that charity shops contained dirty junk that no one else wanted. Not everyone thought that way, but I’d say it was the view of the vast majority. Why on earth would you rummage through someone else's cast offs?? I suppose it’s the same as the idea of “hand me downs” in poorer families in times gone by. I used to love the look of astonishment when, having complimented me on something I was wearing, I’d utter what was almost my catchphrase “what this? £3 from a charity shop...” Priceless! Now though, thrifting is rapidly gaining in popularity. Partly due to the recession, yes. But I’d say largely due to the popularisation of vintage in the last few years. Vintage made it positively de rigeur to wear secondhand. This was swiftly followed by environmental campaigns to reuse and recycle. 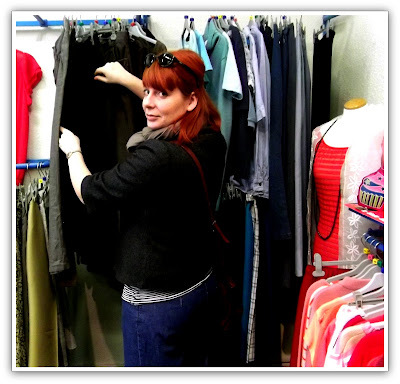 Suddenly it was not only OK to shop secondhand, it was fashionable and eco-friendly, and positively encouraged. These days it’s no longer about the “achievement” or “status” of affording something expensive and designer. It’s about having the savvy to find a bargain. I hear people having conversations about how little they’ve paid for something instead of how much. People are haggling more and they are much more aware of the value of things. Consumers have definitely wised up and competition for bargains is definately hotting up! Are there any flea markets in the UK? What are they like? I guess “Boot Sales” (aka Boot Fayres/Fairs) are our flea markets. They don’t, as the name might suggest, sell only boots! The name derives from people gathering to sell stuff from the back of their cars. We call them car boots, you call them trunks I believe? They’re usually held in car parks (parking lots) and otherwise unused land rented from local farmers or landowners. Sellers turn up early on a Sunday morning, usually around 6am, and line up all their cars in a row, one behind the other. They pay a fee of between £5-£10 for a pitch, and then lay out their “goods” on tables or groundsheets. Buyers begin arriving from around 7am and the sale usually finishes up around lunchtime. This concludes Part I of my Interview with Miss. P. Look for Part II on March 1, 2011. Photos were edited and provided by Miss P. If you would like to be featured, shoot me an e-mail. I would love your feedback on this new segment, let me know what you think in the comments below. My next international interview will be online February 22, 2011. Fun intereview!! it's great to see what thrifting is like in the UK! This is fantastic!! And I agree that thrift is rapidly growing. There are so many more people in the shops-- a few years ago I virtually could have a whole store to myself (that was fun!) but it's nice to finally see an economically healthy trend taking off. This post was so fun to read! Thanks! Oh, I enjoyed this Van! Great interview, and I've now found another blog I think I'll love. Thanks! this is a great blog post. It is fascinating to see what thrifters have in common, no matter where they live. my motivation for thrifting is very similar to miss p - having my own money going further because i shopped thrift as a teenager and loving the look on people's faces when i told them what i paid for an item i was wearing. i still get a charge out that. awesome<3 which reminds me to go on friday to the one I wanted to take pics at to send you the q's! This series is going to be a great addition to the blog, Van. It was nice reading Miss P's take on thrifting across the pond. I too thrifted some of my own wardrobe when I got my first job. It was quite liberating. And still is, given that I can put together an entire outfit for cheap! I love the idea for this post! I'll be looking forward to see more of this feature.